Surfing arrived to the Basque Country in the late 50s, when Hollywood scriptwriter Peter Viertel was in Pamplona filming Fiesta! / The Sun Also Rises, based on Ernest Hemingway’s novel. On a day off he visited Biarritz, on the French side of the Basque Country, and saw the waves. He immediately ordered more filming supplies to be delivered from the US… and a couple longboards. It took almost 15 years for surfing to reach down the Basque coast into Gipuzkoa and Bizkaia, on the Spanish side, but the seed was sown. Today, surfing plays an important role in the Basque lifestyle and economics. Every year, thousands arrive to learn to catch their first foam from one of the many surf schools schools that populate the beaches at Sopela, Donostia – San Sebastian, Zarautz, or Biarritz. Many search further and give a try to Lafitenia, Guethary, Meñakoz or Mundaka, considered one of the best left barrels in Europe. Some delve into the maps (or make good friends with some locals) and find their way to some hidden, secret gems. Only a few dare to ride Belharra, Playa Gris or Perus, gnarly monsters that break only in the biggest swells and are the venues for the most extreme. The Basque Country has it all. From only-for-serious-chargers XXL wáter mountains to pleasant summer beach breaks; from fast, hollow tubes to longboarding meccas. It has even tidal waves in a river and an inland surfing lagoon with man-made 3 footers. Aritz Aranburu, best Spaniard pro surfer ever, is Basque, and so is his coach, the best blind surfer in the World. Gabriel Medina, 2014 World Champion, won his title riding a Pukas board made in Oiartzun, the tiny village where UMC Cycling Sports Director, Allan Davis, lives. 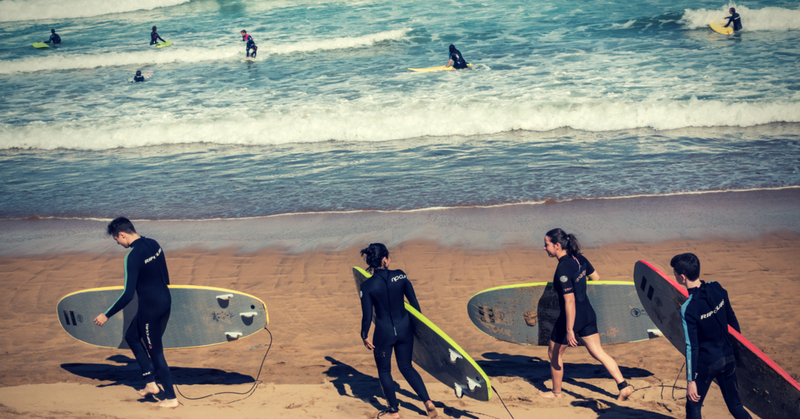 San Sebastian is the destiny for many newcomers who want to learn the basics of surfing. Its world-famous pintxos and the surf schools and rental shops in La Zurriola beach attract both youngsters and adults… and make it a crowded spot. If you are surfing on your own and not experienced, avoid the right side of the beach (“The Wall” or “Sagüés”), home for locals who don’t like to share the waves when it’s pumping. Stay to the middle or left side of the beach, be very respectful with other surfers and don’t endanger them. There are some beach breaks at La Concha and Ondarreta beaches but they require a big swell. Life is better when you surf. United Mint Campus students head into the water for their surf lesson in Zarautz. Zarautz enjoys a more relaxed atmosphere in the water and is less crowded. Schools can be found right at the beach or in the village. “Basque Fiesta” in September can add some cultural flavour (and fun) to any surfing trip here. When the swell is big, it´s time to check out Hendaia, the French village right on the border. Schools and rentals are nearby, and families, beginners and old French longboarders share the waves and the stoke. For the hype-lovers or the mythomaniacs, Côte des Basques beach, in Biarritz, is the place to be. First waters to see a surfboard in the 50’s in France, these sands welcome both beginners and experienced classy, single-fin longboarders. Have an eye out on the tide if you don’t want to get into trouble. Sopelana (a.k.a. Sopela), not far from Bilbao, comprises two different beaches (La Salvaje and Ariaterra-Atxabiribil) and several peaks. Longboarders rule La Triangular, and the wave that breaks between the two beaches. More adventurous riders can head up to spots like Lafitenia, a beautiful and tubey right that breaks between Saint Jean de Luz and Guethary. This small French village treasures two waves: Avalanche/Alcyons and Parlementia. A long paddle to the line-up, and always bigger than they look from the shore. Mundaka is a barrels-only break with the Fall and Winter swells, low tide and South winds, and is home for very protective locals. Many times the venue for the World Pro Tour, this small fishing village in Bizkaia has been for decades the destination for surfers from all over the World – an epic pilgrimage since it was featured in Surfer Magazine in the 70s. Described in 2011 by three-time world champion Tom Curren as simply “the best wave in the world”, the wave had disappeared from 2003 to 2006 due to dredging works. Meñakoz, next to Sopelana, was the Basque biggest ridden wave since a few watermen, led by Zarautz rider Ibon Amatriain, started towing-in to challenge monsters like Playa Gris or Perus. It faces directly to the northwest, and catches the massive swells originated by the low pressures in Ireland. Ibon Amatriain himself had a severe accident years ago in Roca Puta, a spot between Zarautz and Getaria that gets its name from a rock hidden too close to the surface. Ibon, the first european invited to the Eddie Aikau Big Wave Contest at Waimea, Hawaii in 2007, was the inspiration for a small group of riders who started to charge the colossal waves that they saw now and then in their search missions along the Basque coast. This tow-in pioneer opened the path for riders like Axi Muniain –as Amatriain, with several nominations for the Billabong XXL Awards–, Adur Letamendia, Mikel Agote, Natxo González, Indar Unanue, Ion Eizagirre or David Bustamante, regulars at the big wave spots. At the river’s mouth of Bilbao, Punta Galea is home for the Punta Galea Challenge, one of the stops on the World Surfer League´s Big Wave Tour. This dangerous wave can hold 25 ft. some days in winter right under an impressive cliff, and drags wiped-out surfers to the rocks. In Gipuzkoa, Playa Gris –between Zarautz and Getaria– looks less dangerous, but it´s not. It peels without shaping a barrel, but the challenge comes in the form of huge masses of water in the 50-ft. range. A wave rode by Ibon Amatriain gave him a nomination to the XXL Awards in 2006 and opened the potential of the Basque Country to the big wave community. Perus (a.k.a. Agiti) breaks in the range of 25 ft. behind Mount Igeldo, in San Sebastian, and has been ridden just a few times due to the fact that it breaks very close to the rocks and its shorebreak makes it almost impossible for the jetskis to rescue surfers if they get caught inside. Very few days every year, Belharra breaks up to 25 ft. 1 mile from the shore in big swells between Hendaie and Saint Jean de Luz, on the French side of the Basque Country. As Playa Gris, this wave has given several nominations in the extinct Billabong XXL Awards. After becoming one of the youngest editors-in-chief in Spain at a top newspaper, Roberto has been a tech entrepreneur, a PR exec, and a media consultant.